Seen from the shadows, those on the dance floor appear as shimmering stars swirling through an indigo sky. But they are not what they seem. Their real and disparate lives have little to do with the love songs they dance to so gracefully on Sunday nights. Beneath the throbbing colored lights are dancers like Joseph, counting out rhythms in Â¾ time. With the music playing and Sarah in his arms, Joseph imagines what love might be. Later that night, in the solitude of his shabby Greenwich Village apartment, he will make anonymous phone calls, imagining that the women on the other end of the line were Sarah. BALLROOM is the ensemble tale of six distinctive and diverse characters who come to the ballroom to dance, to pretend, to desire, to seduce. It is a novel about the things each searches for within and beyond the gilded hall of this shabby universe on Union Square before the wrecking ball arrives. BALLROOM is based on Alice Simpson’s nights spent dancing at clubs, ballrooms, and on barges on the Hudson River. 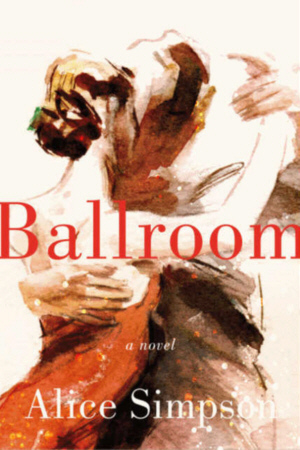 The first four chapters of BALLROOM were awarded the second place award for fiction in February 2013 at the San Francisco Writers Conference. Alice was nominated by The Writer’s Voice (NY) for Best New American Voices, chapters from the novel have appeared in WV (Writer’s Voice Magazine, NY), Words & Images Journal (U. of Maine), in TangoDanza Magazine (Berlin), and in a limited edition book, Tango Bar, purchased by Lincoln Center, Yale, Harvard and The Victoria & Albert Museum for their special collections.